At first glance, your reaction would be “Oh No, not another boring match-3 puzzle game”. No you are wrong. 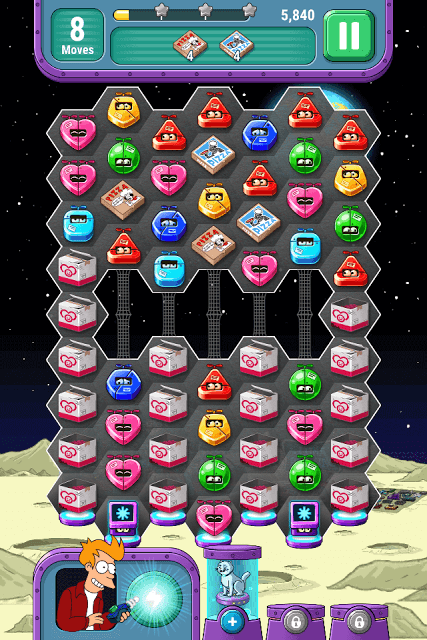 Wooga’s Futurama: Game of Drones is a match-4 puzzle title and it isn’t ashamed to mock Candy Crush Soda Saga despite being an outright clone (Personally I think it’s an excellent parody game of King’s epic match-3 title). You will have to match 4 or more drones on a hex grid to deliver them safely to customers. There are Super drones and SUPER DUPER drones that will help you reach your objectives faster. The game also boasts boss battles, where you will have to match drones to reduce enemy’s HP to zero. Line Drones Can Help You Clear Out a Line of Your Choice. You can create a Line drone by matching 5 normal drones of the same type. With a Line Drone, you can easily remove a bunch of drones in the direction of your choice. You can move this Super Drone up, down, left, right and diagonally and it will adapt to that direction and clear out drones vertically, horizontally or diagonally. Take advantage of a Line Drone’s flexibility and try to use it on a column or row that has more target drones or obstacles. For example, if there are more red drones on the diagonal row and you need to collect them to complete the game’s objective, then you can move the Line drone (in case it’s closer to them) in that direction to collect them. If you combine two Line drones, you will create a Super-Duper Line drone. This Super-Duper drone can clear drones in every direction once it has swapped places with a drone. This can really help you clear a maximum number of objects. Create a Triple-Dipple Super-Duper line drone by combining a line drone with a bomb drone. Once swapped places with another drone it can remove three lines of drones in the direction you have moved it. So if you have moved it diagonally, then it will clear out all three diagonal rows. Prism drone close to a red drone, then you can swap places to remove all drones of that color. Prism drones are hard to create as you will have to match 7 drones of the same color to make one. Use it only when there are several drones of one type scattered on the game board. Just by scanning the game board, you can easily find out which drone has several same-type drones spread across the board. If you combine a Line drone with a Prism drone, you will create a Super Duper Line Prism. Now swap places with a drone and all drones of that color will be turned into line drones. A prism drone combined with a bomb drone will create a Super-Duper Bomb Prism. If moved into another drone, it will turn all drones of the same color into bomb drones. A Prism Drone combined with another prism drone can clear the entire game board. You should focus on your objectives first and try to complete them before doing anything else. Most objectives range from collecting certain numbers of a drone to removing toxic waste or clearing out obstacles. Try to create more and more “Super Drones” by matching 5 or more drones of the same type. Look for matches of 5 and above. If you can’t find any, then start matching 4 drones of the same type. Once a special drone is created, don’t use it right away. Pay attention to your objectives and make sure the special drone plays an important part in completing them. Try to match other drones to create more super drones. You can then swap places of two super drones to create “Super Duper Drone”, which can be of immense help if you clear out a major part of the board and this will help you reach your objectives faster. A character’s special power will also help you to complete your objectives. Keep matching drones and creating super drones to fill the character’s special power meter. You can use a special power meter right away, because the meter fills up pretty quickly. Every time you use a character’s special power, it will help you remove more drones in one way or the other. And this can help you reach your score targets or objectives faster. Use boosters wisely. You get only 2 free samples of a booster. Try to use them in levels that are very difficult to complete. If you fail to complete a level twice or thrice, then you may consider using them. Bomb drones can be created by matching 6 drones of the same type. These bombastic drones explode twice when swapped with a drone. They can be very useful to clear surrounding pool of toxic waste, boxes and other obstacles. If you combine a bomb drone with another it will create a similar-looking Super Duper drone. Swap places with another drone and it will trigger a bigger explosion and remove more surrounding objects. Great Article. Fun to read too. Thanks for this!